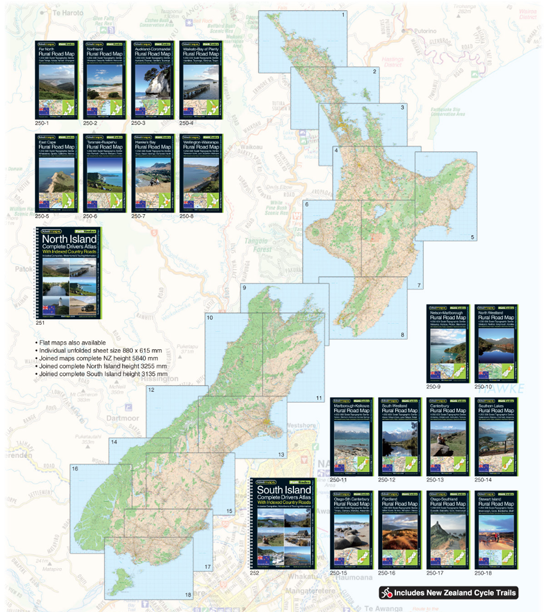 These road maps are great for getting off the main roads and out into New Zealand's amazing back country. maps covering NZ at 1:250,000 scale. maps with ALL the rural roads named. The maps are $9.90 each. Get the maps laminated in a low sheen laminate for $15 to $20 extra each. The atlases are $34.90 per island. Clicking on the links below will open a map showing the coverage of each number from the Index on the right.